The highly anticipated OST of MBC hit drama series The Moon Embracing the Sun released as planned on March 13th, 2012. 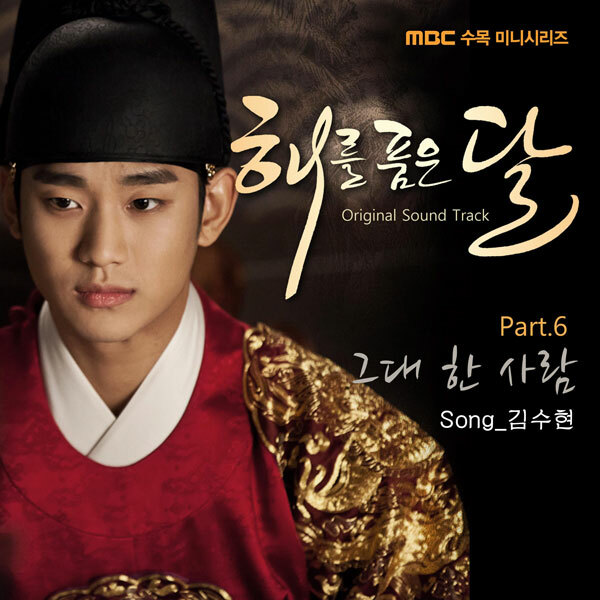 The Moon Embracing the Sun OST part 6 includes the song with the title of The One and Only You (그대 한 사람). As announced beforehand, the song is sang by the actor in leading role in the drama, Kim Soo Hyun (김수현). The song title has also been translated as “Only One Who is You” and “Only You One Person.” The fans in China has translated the title as “That Time, That Person” (那时, 那人). The song is showing the emotion of Lee Hwon who is played by Kim Soo Hyun to his beloved Yeon Woo (played by Han Ga In) through truly loving confession that is dedicated to the woman whom he deeply loved. The song completes the love of lead male and female characters in The Moon that Embraces the Sun that is full of obstacles. With the modest melody coupled with distinctive bass of Kim Soo Hyun, the song expresses the true love that cannot be forgotten, touching the heart of many fans. The song may not make it to the drama as PD feels that the inclusion of the song may interface with the development of the drama. Listen to The One and Only You (그대 한 사람) at YouTube, or a fanmade MV at YouTube. When the rain falls from the sky and the moon appears, will you? Can you hear my voice, can you hear? Then, could I look at you once?